Alaska Airlines only took up this name in May 1944 having first begun operations as McGee Airways back in 1932. By 1941 it was Star Air Service and was taken over by a disreputable character by the name of Raymond Marshall, who renamed it Alaska Star. Marshall was a New York businessman and something of an absentee owner who appears in hindsight to have really only interested in funnelling money to himself to the detriment of his airline. He listed himself as Vice President but hired and fired the airline's Presidents. Marshall's business was junk and he had a shocking approach to maintenance, which basically saw him either refuse it or send sub-standards parts to the airline. It appears pure luck that Alaska didn't have any accidents attributable to Marshall's actions. He was universally loathed by his employees, many of whom quit. He was particularly disliked for making his pilot's pay for fuel out of their own pockets since the oil companies wouldn't give Alaska any credit. They always got their money back but this penny pinching approach only served to alienate everybody. Marshall didn't seem to care however. At the time the airline's President was an oilman called Theodore Law who was the major shareholder thanks to a $250,000 investment he made in 1943. He had acquired the airline's first new equipment, a Lockheed Lodestar, by paying for most of it himself, since Marshall would have never given him permission otherwise! 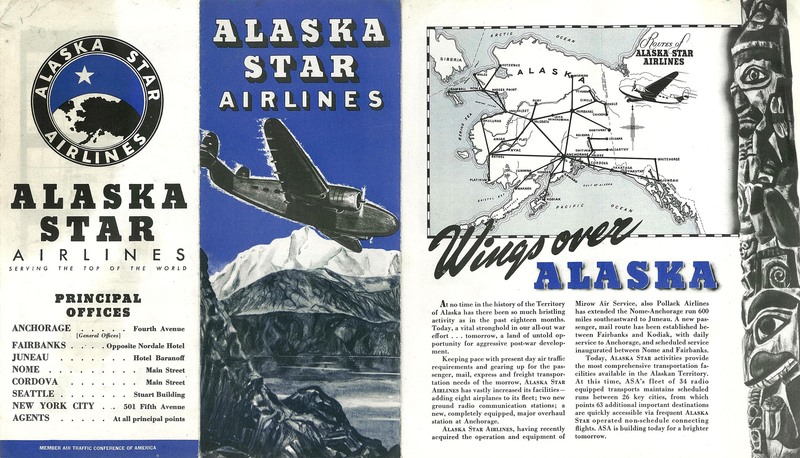 The Lodestar was used on the airline's premier route - a thrice weekly service between Anchorage and Juneau. Ted Law it seems quickly ran out of patience with Marshall and sold his stock in early 1944 leaving Marshall in full control. Marshall named himself Board Chairman and hired Marshall Hoppin as President. Following the end of World War 2 there were plenty of bargains to be had acquiring barely used secondhand war surplus Douglas C-47s (DC-3s) and C-54s/R-5Ds (DC-4s) and it seems even the ever thrifty Alaska could afford some. Hoppin began acquiring both C-47s and C-54s, which led to the airline also hiring its first stewardesses. The extra costs of this and pilot training however raised the ire of Marshall and Hoppin was summarily fired in 1947 for this 'extravagance'. His replacement, James A. Wooten, would take Alaska Airlines places it had never been before or since! Wooten could see an opportunity where there was one and under his tenure Alaska expanded into a new niche, worldwide charters. In fact Alaska grew so big it briefly became the world's biggest charter airline. Wooten had previously been the head of American Airlines cargo division and had in 1946 attempted to create a centralised hub for airfreight using 6 DC-4s. When this lost a fortune it was closed down by C.R. Smith and following him refusing to operate DC-4s in convertible config for night time cargo ops Wooten decided to try something new. This DC-3 is shown at Tigvariak Island, off Alaska's north coast, in the spring of 1949. Photo by Rear Admiral Harley D. Nygren, NOAA Corps (ret. ), from the NOAA Corps Collection. NC91008, above and below, was originally 43-48161 with the USAAF and was one of at least 6 C-47s to serve with the carrier. She remained in service until late 1953. On a positioning flight on 8th August 1954 the aircraft was lost when it struck a mountain 40km northwest of McGrath killing the two pilots. Two further aircraft have masqueraded as 91008 since. An ex-United and Delta example (cn 6337) was painted in Alaska colours and displayed at the Museum of Flight in Seattle from 1992 whilst she was replaced on display in 1997 by cn 2245 an ex-TWA and Ozark example. Wooten's chance came when the Alaska board of directors offered him the position of President at Alaska. Given Marshall's grip on the company Wooten seems like an unlikely choice, but he seems to have either won over Marshall or convinced the board to back him regardless. Wooten took full advantage of the great sell-off of military equipment by the War Assets Administration and acquired a selection of used DC-3s, C-46 Commandos and C-54s. It is a little hard to say quite how many joined the fleet but it looks like by 1948 there were about 5 C-47s, 3 or 4 C-46s and maybe 5 or 6 C-54s. Wooten successfully acquired business around the world meaning Alaska Airlines aircraft could be seen hauling freight or operating charters in places like Japan, China and the Middle East. Alaska became embroiled in some of the most famous airlift operations. In 1948 the airline's C-54s operated 87 flights as part of the Berlin Airlift and even flew German warbrides (who had married US soldiers) out in the opposite direction. More famously Wooten also made Alaska front and centre of the Magic Carpet airlift operation, which we'll look at in ﻿part 2﻿ of this story. If Wooten had stuck to operating international charter and freight operations he may have survived. Certainly Alaska Airlines needed the revenue as it owed $350,000 at the time he joined. Unfortunately for everyone Wooten couldn't resist getting involved in the burgeoning non-scheduled scene. Following the end of the war literally thousands of new 'airlines' started operations, often with little interest in safety let alone authorisation to fly particular routes. They were allowed to operate charter services (and became known as non-skeds) but many went into effective competition with the scheduled trunk airlines by cheekily flouting the rules or finding convenient loopholes to get around them. Alaska was a fully certified airline and not a non-scheduled one but that didn't stop Wooten from testing the CAB's patience. He moved Alaska Airlines headquarters to Everett, Washington's Paine Field after convincing the airport to build him a hangar. Then he began running a range of what he called 'frequent nonscheduled flights' that broke all the rules. Basically they were charters that operated to a schedule and were so frequent they became unauthorised scheduled services. Routes like Chicago and Minneapolis to Seattle or Paine Field to Anchorage. It's hard to see how Wooten thought he'd get away with these flagrant breaches and he did not for long. The CAB whacked Alaska Airlines with a $34,000 fine, not just for the illegal servies but also for unqualified pilots and running engines well beyond their overhaul dates. Wooten himself earned a $1,000 fine and resigned as President on October 14, 1949. This left Marshall back in full control and somehow he survived until 1957 despite the CAB getting increasingly angry with him and limiting his freedom of movement from 1953. Marshall still managed to siphon off millions of dollars from the airline, which he basically seems to have used as a personal funding source. The most lasting aspect of Wooten's short tenure at Alaska was definitely its services in the Middle East and it is these we'll take a look into next.